The Kauffman Road Bluegrass Band will perform at the 1858 Meeting House in Mechanicsburg on Saturday. 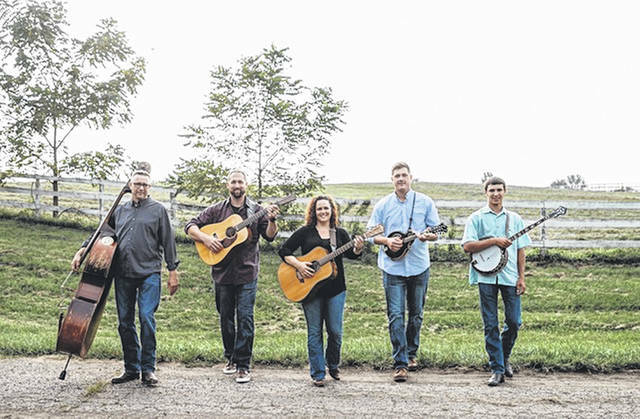 MECHANICSBURG – On Saturday, April 20, the Kauffman Road Bluegrass Band will give a 7 p.m. concert at the 1858 Meeting House, 43 E. Sandusky St., Mechanicsburg. Doors open at 6 p.m. Band members consist of Daryn Steed (Bass), Gabe Stout (banjo), Kelsey Dobbs (rhythm guitar, lead and harmony vocals), Kale Richardson (mandolin, lead and harmony vocals), and Bo Richardson (lead guitar, lead and harmony vocals). Tickets at the door: $10 Adults, $5 Students, Kids 12 & under free. Max Family $25. All proceeds go toward the preservation and maintenance of the 1858 Meeting House, owned by the Champaign County Preservation Alliance. Submitted on behalf of the Champaign County Preservation Alliance.